The top 10 drum corps in the world will be competing in the 21st anniversary edition of Drums Along the Waterfront Tour of Champions at 6 p.m. Sunday, Aug. 5 at New Era Field in Orchard Park. And when they arrive in Western New York, several local schools will open their doors and play host to hundreds of talented participants. Blue Devils, Sunday, Aug. 5 at Martin Road Elementary School in Lackawanna. Founded in 1970 from a drum and bell corps, The Blue Devils hold the record for the most Drum Corps International World Championship titles. The corps has won a total of 18 times, most recently in 2017, and has not placed lower than fourth in the last 25 years. BD Performing Arts organization sponsors the Blue Devils and a variety of performing arts ensembles including two Open Class drum corps. Bluecoats, Saturday, Aug. 4 and Sunday, Aug. 5 at Orchard Park High School. The Bluecoats organization was founded in 1972 as an outreach program of the Canton, Ohio Police Boys’ Club. The corps’ name was chosen in tribute to the city’s retired police officers. Making its competitive debut in 1974, fans traditionally welcome the corps to the field with a signature cheer of “Bloo!” The corps has finished in eighth place or better since 2001, winning their very first DCI World Championship title in 2016. Blue Knights, Sunday, Aug. 5 at Akron High School. The Blue Knights were founded in 1958 by former vaudeville comedians and musicians Fred and Faye Taylor. Recognized for innovation in visual design and contemporary programming, the Blue Knights have been a DCI World Championship finalist more than 20 times. Operating under Ascend Performing Arts, the organization also sponsors other ensembles including an award-winning indoor percussion ensemble and the first-ever NFL drum line, the Stampede. Ascend also conducts numerous events, educational clinics and provides event entertainment worldwide. Boston Crusaders, Sunday, Aug. 5 at Pioneer High School, Yorkshire. The Boston Crusaders were founded in 1940 as the Most Precious Blood Crusaders. Separating from the church parish that sponsored the group in its early years, the corps became the Hyde Park Crusaders and later the Boston Crusaders as it established itself as a national powerhouse. A charter member of Drum Corps International in the 1970s, it would not be until 1999 that Boston skyrocketed into the DCI World Championship Finals. The corps has retained its spot among DCI’s elite Top 12 ever since. Madison Scouts, Sunday, Aug. 5 at Erie Community College South Campus, Orchard Park. Founded in 1938 and celebrating 80 years in 2018, the Madison Scouts is a premier youth performing arts organization on the modern drum and bugle corps scene. “Proud, Loud and Pleasing the Crowd” — a mantra of the corps — the Scouts are known for their entertainment-focused programs that consistently bring audiences to their feet. They are a founding member of Drum Corps International and have been twice crowned as DCI World Champions (1975, 1988). Forward Performing Arts, the parent organization of the drum corps, also sponsors SoundSport, DrumLine Battle and WGI Sport of the Arts ensembles. Mandarins, Saturday, Aug. 4 and Sunday, Aug. 5 at Silver Creek High School. Founded in 1963, the Mandarins organization has long been known for blending Asian traditions with drum corps. The corps has been a DCI World Champion in its class eight times, including an unmatched string of four titles as a Division III unit between 1996 and 1999. Mandarins started competing as a World Class corps in 2003. The Academy, Sunday, Aug. 5 at Dunkirk High School. With musical-athlete membership 154 strong, The Academy compete in Drum Corps International’s (DCI) World Class level. In the corps’ first trip to the DCI World Championships in 2006, it won the gold medal in Division II competition. 2016 marked the corps’ first year as a World Class DCI World Championship finalist. The corps is currently ranked 13th in World Class, with their eyes set on reaching the coveted top 12 ranking in the world once again. The Cavaliers, Sunday, Aug. 5 at Niagara Falls High School. Celebrating 70 years in 2018, scoutmaster Don Warren founded the Cavaliers in 1948 as Boy Scout Troop 111 Drum and Bugle Corps. Long nicknamed the “Green Machine,” the all-male corps’ trademark geometric drill routines and aggressive color guard work make them instantly identifiable. The Cavaliers have won seven DCI World Championship titles since 1992, most recently in 2006. The organization additionally runs a number of performing arts programs including successful indoor percussion and winds programs that compete as part of the WGI Sports of the Arts competitive circuit. 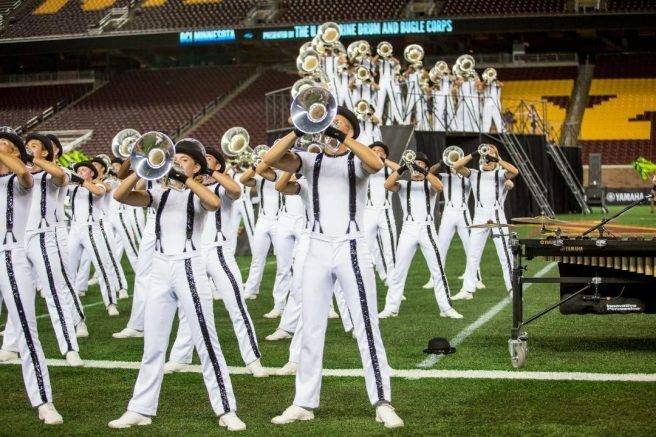 For drum corps staying in WNY on Saturday, Aug. 4, rehearsals will take place from 10 a.m. to 10 p.m., with the best time to watch from 7 to 10 p.m. Rehearsals on Sunday, Aug. 5 take place from 9 a.m. to 4 p.m., with the best time to watch from 1 to 4 p.m. All rehearsals are free and open to the public (except the Blue Devils with closed rehearsals at New Era Field). Audiences are asked to be quiet and respectful during the rehearsal process. To learn more about the Drums Along the Waterfront Tour of Champions event, please visit www.DrumsAlongTheWaterfront.org or follow Drums Along the Waterfront on Facebook for frequent updates. Be the first to comment on "Local schools to host Drums Along the Waterfront musical athletes"